You are here: Home / Series / Sourdough / Sourdough Explosion! This is what happens when your sourdough starter is really active. We were in the living room when we heard the explosion over everyone cheering while playing a game on the Wii. It sprayed the starter in a ten-foot radius. 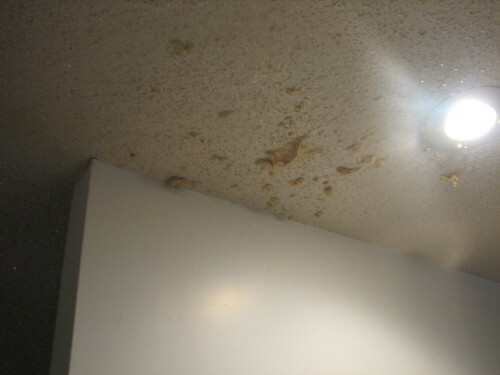 It damaged the ceiling and took a while to clean. I’ve never had a sourdough explosion before. I always make my starter with equal parts apple juice kefir and freshly ground flour. The only difference is that today I added a couple pinches of freshly-ground teff when I fed my starter. Teff, like rye in the world of gluten, is very active when added to sourdough. I took the remaining starter and made pizza crust for tomorrow. I will make pancakes in the morning for breakfast. I took a new lid and ring and loosely put it on the jar, in case it decides to do a repeat performance tonight while we’re asleep. I put it in the middle of the bar, on a towel, with nothing near it, so if it overflows it won’t make a mess. I’ll start the sourdough over after that, this time in a bigger container! This post is part of Get Real Tuesday. I keep a loose cover on my starter for this reason! Something that I’m trying is a dry sourdough starter, made from this ‘recipe’ http://www.sourdoughbaker.com.au/starters/desem-sourdough-starter.html I haven’t used it yet, still in the first stages but I’m looking forward to trying it in the next week.